PRI is excited to announce that we will have a Japanese microsite being launched soon! 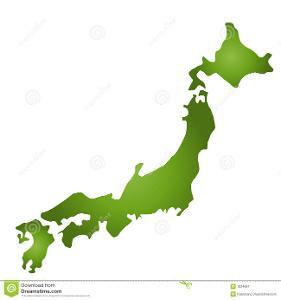 In July, two Myokinematic Restoration courses will be taught in Japan, and we are excited about the future growing of the science of Postural Restoration® in Japan! The microsite should be launched in the next couple weeks, and course registration for the July 19-20th course in Osaka, Japan and the July 25-26th course in Tokyo, Japan will be available at that time. These two courses will be taught in Japanese by Sayuri Abe-Hiraishi and Kentaro Ishii. Each course attendee will receive a course manual which includes both English and Japanese text. I am so excited to be making the trip with them to Japan this summer! If you have any questions about the upcoming courses in Japan, be sure to email me or Sayuri! Ron had a chance to respond to a recent email question regarding the respiratory mechanics when doing the left Sidelying Respriatory Scissor Slides. As you might have noticed in the handout for this technique, the respiratory mechanics are different for the left and right sidelying positions. CLICK HERE to learn more about this technique! 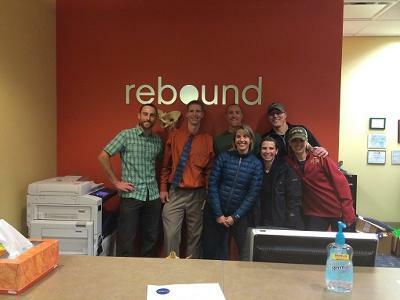 Lori and I enjoyed our time and journey teaching Pelvis Restoration with the group of movement enthusiasts at Rebound Sports Physical Therapy this past weekend. An engaging and fun group whose particular attention to clinical and on-field applications of pelvic inlet and outlet position will be applied readily. Inhibition and detecting the best time to inhibit based on special test findings was a good topic covered in detail. Thanks again to all who attended and helped make this weekend a snowy, enjoyable event for all! Due to my fascination of our asymmetrical and lateralized human body, I decided to investigate further into this concept and how it manifests functionally as well as rhythmically throughout our systems. In PRI, we are typically focusing on creating a reciprocal and alternating neuromuscular system. However, our neuromuscular system is connected with all the other systems in our body. There appears to be a coupling between autonomic, central, endocrine, and gastrointestinal systems which, in parallel with our neuromuscular system, are also asymmetrical and rhythmically shifting. “Asymmetry, Lateralization, and Alternating Rhythms of the Human Body” has been broken up into 5 parts describing this phenomenon in addition to the story of how and why our asymmetry came to be. It can also be accessed at on my website where I have written on other various topics that relate to PRI. Doug Kechijian, PT, PRC was on the Robb Wolf podcast recently to discuss the relationship between PRI methodology, movement variability, and adaptation to training. Follow Doug on Twitter here. 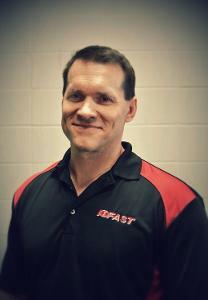 Bill Hartman, PT is co-owner of Indianapolis Fitness and Sport Training and IFAST Physical Therapy. He has over 25 years of experience in the rehabilitation, fitness, and sports performance fields at all levels of experience and competition. His treatment approach and clinical success has made Bill an in-demand clinical instructor for physical therapy students from all over the country with many of his students going on to successful careers in a variety of environments including professional sports. Bill has been featured on numerous national publications and sits on the Advisory Board for Men’s Health Magazine. He also is currently participating in formal research interests that include the influence of the nervous systems on movement and performance. To see a complete list of speakers or to register for the upcoming Interdisciplinary Integration course, CLICK HERE! I had a great weekend in Southern Florida with David Donatucci and his staff of Florida Insitute of Performance! We all welcomed a rather large group into the world of PRI and Myokinematics of the Hip and Pelvis! Since I have been teaching for PRI, I have seen the audience evolve. 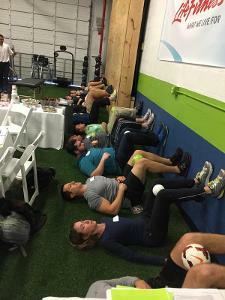 This class was heavily attended by Performance professionals! It was great having my husband Chris Poulin with me to lab assist as he could share his personal experiences integrating AFIR and AFER into a performance setting. After so many years of wanting to get this PRI fire started in Floirda, I believe the brush fire is soon to spread like wild fire! So great to see the PRI NATION evolve! On January 24, 2015 I revealed my collective thoughts and recommendations on how to assess and manage the patient who is in a Left Side Bending or Right Torsion cranial position, with underlying Right Temporal Mandibular Cervical Cranial patterned muscle. The course attendees were so helpful in providing insight on how to make the course better in the future, were so patient with me and my supercilious tangents, and were so understanding on the difficulty I was having in delivering 35 years of integrated thoughts on dentistry, physical medicine, respiratory function, osteopathy, and neurologic behavior in only two days. However, these were the same people that have nurtured me over many years and have supported me in ways they will never truly understand. Individuals who have demonstrated passion for what they do, belief in that they can make a difference if they think differently, and courage to be unconventional, brave, and transgressive to the end; all traits of a Renaissance practitioner. I wish I could talk about each and every one of them in this message, but want to identify four who have initiated and revolutionized our industry and practice outcomes. If it was not for the insight and risk taking of Michelin Carroll in 1998, maybe 1997, I would never have been introduced to the great people of Vermont at a very tentative and somewhat tortuous time of my life, nor established a good foundation for PRI in an area where cortical and creative correspondence is at an unbelievable level. She and many others around her made Burlington Vermont my second home for many years. Friendly, family and fun come to my mind in those years. I have been there countless times since and would never be able to accurately account for all the courses and topics I talked on over the last 15 to 17 years in this great state. Michelin fueled the Institute in those early years and her sincere desire to promote these concepts, of a Midwesterner, whom she never met before, gave me the confidence and support that I will forever be grateful for. Two nights before the course I met with Holly Spence at her clinic, Cornerstone Physical Therapy, to consult with her and assess a cervical cranial patient whom she is treating. I have known Holly also for more than 15 years and her interest in Integrating Physical Therapy with Dentistry has always intrigued and impressed me. She is one of the nicest and most humble people you will ever meet, but most importantly she is resilient. She gets it! She gets that occlusion and cranial orthopedics patterns are directly related. I love being around her because of the manner in which she instructs, teaches and represents integration with a multi-disciplinary mind and with a positive, calm and patient delivery of, what can be, inflammable science. Holly, was invited to come to Brazil in 2013 and talk about collaborative treatment for the complex dento-facial patient using PRI concepts, good physical therapy intervention when needed and the biopsychological implications associated with a team approach. She is such a blessing and it was so awesome to have her presence in this class for so many reasons. In 2004 I met a spirited and ardent individual who along with Holly became certified in Postural Restoration in 2007. Estelle LeClair and her family have endured the pain, frustration and hardship associated with the construction, design and manufacturing of two PRI pools. 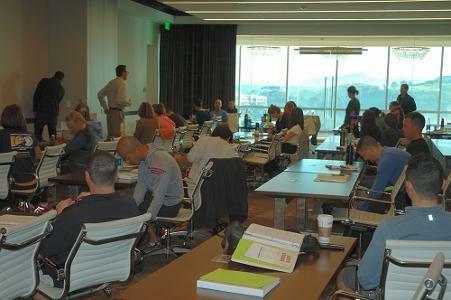 I enjoyed giving an inservice to her staff the day before this course, because I had the opportunity to once again experience the programmed directed flow of water to inhibit patterns of neuromuscular function and retrain new integrated references for upright dryland operation facilitated by gravity and the ground. Her hard work over the last 6 years, ongoing spirit of resolve and determination has created two beautiful pools, the PRIORI and PRISM PASSAGE. I still can feel the sequential flow of water provided by the Hemi – Hula Hoop and Rotation Cove stations that reduces torsion on the back, neck and hips with so many possible applications and processes. She is a pioneer and a role model for all of us and I will always feel indebted to her for her stamina and willingness to pave the way for PRI Aquatic future opportunities. On the evening of the first day of the course I had the wonderful opportunity to peruse the two PRI Course manuals that Michal Niedzielski had translated into Polish. Miokinematyczna odbudowa wzorcow zespolu ledzwiowo-miedniczno-udowego (Myokinematic Restoration An Integrated Approach To Treatment of Patterned Lumbo-Pelvic-Femoral Pathomechanics) and Poprawa funkcji knompleksu piersiowao-brzusznego (Postural Restoration An Integrated Approach to Treatment of Patterned Thoraco-Abdominal Pathomechanics) are the first two PRI courses ever translated in a language other than English. Michal, for those who know him, is full of energy and expression. I really love this man. I have met his family, have gone to Poland to understand his culture and feel that we have a special relationship because of his questioning, eagerness to learn and need to understand my “mind”. As I get older I feel honored to have him as a friend and colleague and someone who I will always respect for his undying commitment to excel and exceed regardless of language barriers, cultural differences, and beliefs surrounding postural asymmetries and disparities. He became a member of the PRC family in 2007, however, I feel he has been a family member long before that with his first attendance of a course that I taught many, many years ago. I am not sure Michal even knows how many courses he has attended since then, but I respect him so much and envision he will continue to promote and provide the direction for those who speak his language, both English and Polish. This truly was four days of Renaissance, Recollection and Revolvement, and these four people reflect what I truly believe we all strive for, Respect. San Diego California is beautiful all year long and this past weekend was no exception. Beautiful weather, cool crisp ocean air and a beautiful group of medical, rehab and fitness professionals made the weekend a grand success. A big thank you to Kahl Goldfarb, PT and the Water and Sports Physical Therapy group for being such gracious hosts. I hope we can continue to team up to bring more PRI courses to the San Diego area and keep the enthusiasm going. And thank you to my two PRI associates, Skip George, DC, PRC and Heather Jenny, PT, MA, WCS, GCS, BCB-PMD, PRC for assisting me with the course. It was great to have you both assisting with lab instruction on the manual techniques and to have you available to answer questions throughout both days. It is a pleasure to mentor you and to be mentored by the two of you. Author’s Note: This is the third installment in an ongoing series on my blog, Integrative Human Performance, meant to introduce the Postural Restoration Institute and the concepts that it teaches, as well as how I integrate them into training and rehab. You can view this post in its original format on the blog by clicking here. If you missed either of the first two installments, you can click here for Part 1 and here for Part 2 to give those a read. In this installment, I’ll move from the neurological and biochemical/molecular underpinnings of PRI’s methodology discussed in Part 1 and Part 2, respectively, to the more palpable anatomical component, including the common postural and movement patterns that the PRI model describes. If you enjoy this piece then be sure to toss us a follow on Twitter or “like” our Facebook page to get updates on our latest blog posts. Take a look at Leonardo da Vinci’s world-famous Vitruvian Man and you’ll see what most people take for granted: humans are symmetrical beings. After all, we have two arms that look the same, two legs that look the same, and if you cut us down the middle the two halves would appear to mirror each other. I’m no geometry whiz, but that sounds pretty damn symmetrical to me! The fact is, however, we are not perfectly symmetrical, and if we inspect this claim in some detail it’s really not that hard to see. Take this project, for example, where they cut pictures of peoples’ faces in half and then remade complete faces using each half as a mirror-image for it’s new complementary half. Notice a difference? It’s actually quite surprising–almost all of the people look noticeably different when you use one side of their face to generate a mirror image than does the same procedure with the other side! If you more closely inspect other areas of the human body, you’ll find similar patterns. And that’s really what the practical component of PRI is: identifying and correcting patterns of posture, movement, and muscle activity. Before I delve into the nitty-gritty, I want to emphasize one point: the patterns that I’m about to discuss–at least some of them–are perfectly natural and normal. For the most part, there is nothing inherently wrong with these patterns, and hence no reason to pre-determine that they need to be “fixed”. It is only when we become so engrained in these patterns that we can’t get out of them–analogous to, and as I will explain actually connected to, the inability to vary autonomic states–that problems can arise. My point is that just because a person is in a certain pattern does not mean we need to mess with that pattern. And it’s also important to note that not all pain and injuries are a result of these patterns. Pain is a complex and relatively poorly understood phenomena (although there’s a lot of great research being done and published), but it is unquestionably a multifactorial issue; I highly recommend doing some reading on the biopsychosocial model of pain if you’re not already familiar with it. -The Anterior Interior Chain (AIC) consists of the diaphragm, psoas, iliacus (these two are treated as separate muscles, as opposed to one iliopsoas muscle), tensor fascia latae, vastus lateralis, and biceps femoris. The AIC can be visualized more simply as the muscles on the anterior side of the body from the knees to just above the bottom of the ribcage, excluding the abdominal musculature. These two chains (again, one on the right and one on the left) influence trunk rotation, hip flexion, as well as movement of the ribcage and spine. Due to the aforementioned asymmetries in the human body, the left Anterior Interior Chain tends to be more active than the right; people presenting with this pattern (aptly called the Left AIC pattern) have a right-sided bias in their lower body. In more precise terms, the AIC is responsible for ipsilateral swing phase and thus drives the transition to contralateral stance phase, so those with a Left AIC pattern tend to get stuck in right stance. It is also possible to have the Left AIC pattern bilaterally (the right hip’s position would mirror that of the left); these people are said to have a PEC pattern (addressed further below). -The Brachial Chain (BC) consists of the anterior and lateral intercostals, deltoids, pectorals, Sibson’s fascia, triangularis sterni, sternocleidomastoid, scalenes, and the diaphragm (the diaphragm is included in multiple chains and can be considered the “most important” muscle in the PRI model, as it sort of ties the chains together). The BC can be visualized more simply as the muscles on the anterior side of the body from the neck down to the bottom of the ribcage. These two chains influence cervical rotation, shoulder movement, and expansion of the chest and ribcage. The BC on one side works in tandem with the AIC on the contralateral side; since the Left AIC is more active, we thus tend to see the Right BC pattern as the most common presentation. It is also possible, much like the AIC, to have the Right BC pattern on both sides (the position of the right ribcage and left scapulothoracic complex would mirror that of the left ribcage and right scapulothoracic complex, respectively); such people often also present with a PEC pattern and are said to have a Bilateral BC pattern. -The Posterior Exterior Chain (PEC) consists of the latissimus dorsi, quadratus lumborum, posterior intercostals, serratus posterior, multifidus, spinalis longissimus, semispinalis fascia and muscle, and iliocostalis lumborum. The PEC can be visualized more simply as the muscles on the posterior side of the body from the top of the pelvis up to the neck. 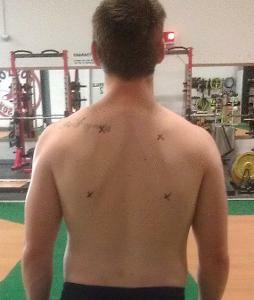 These two chains influence the position of the spine, pelvis, and ribcage and act in opposition to the BC’s and AIC’s. Because the precipitating cause of a person transitioning from having the Left AIC pattern on one side only to having it on both sides tends to be their use of the back musculature (or PEC) to achieve right trunk rotation (since the muscles normally responsible are in a compromised/mechanically disadvantageous position), such people are said to have a PEC pattern. -The Temporal-Mandibular-Cervical Chain (TMCC) consists of the longus capitis, obliquus capitis, rectus capitis posterior major, rectus capitis anterior, temporalis (anterior fiber), masseter, and medial pterygoid. The TMCC can be visualized more simply as the muscles of the head and neck. These two chains influence cervical rotation, extension, and lateral movement, as well as orientation of multiple bones of the face and skull. The TMCC is covered in PRI’s secondary courses, and thus can be considered as more “advanced” material. As such, I will not cover it to any great extent in this series. As I previously explained, the natural anatomical and neurological asymmetries of the human body dictate that, to some degree, we have a bias towards our right side. This causes a tendency to “sink into” our right hip, which manifests as the lumbosacral complex rotating to the right. The net effect is a right hip that is positioned in a state of relative extension, internal rotation, and adduction, and a left hip that is positioned in a state of relative flexion, external rotation and abduction. These positions are typical of a Left AIC pattern; a person with a PEC pattern would essentially have a right hip position that mirrors the left (flexion, external rotation, and abduction). These positions constitute the typical Right BC pattern. A person with a Bilateral BC pattern would have a right ribcage position that mirrors the left (externally rotated and elevated) and a left scapula position that mirrors the right (anteriorly tipped, protracted, and depressed). It’s important to note that one pattern can actually underlie another: since the Left AIC and Right BC patterns can be considered essentially inherent due to our natural asymmetries, even if someone develops a PEC and/or Bilateral BC pattern they may still have underlying Left AIC/Right BC tendencies. For example, while we would expect someone with a PEC pattern to be in chronic hip flexion on both sides, it is possible and actually fairly common for the left hip to be flexed to a greater degree than the right, as we would expect in a Left AIC pattern. Keep in mind, however, that all of these patterns, positions, and compensations can exist along a spectrum; that is, the degree to which these patterns exist can vary from individual to individual and is absolutely influenced by external factors specific to the individual’s lifestyle. I will address this concept in a later post. The chronic positioning of these joints can have an effect on the resting length of the muscles that cross that joint. If the left hip is in a chronic state of flexion, for example, then the hip flexors will be put in a shortened state. I’ll cover ways of addressing specific patterns and muscles in my next post, so I’m not going to list and describe the common/expected resting state of every muscle. One aspect of this model that is worth noting, however, is what I call the Second Commandment of PRI: muscles must be considered as having an effect on movement in all three planes, even if they are a prime mover in a single plane. The gluteus maximus, for example, can be considered as a prime mover in the sagittal plane via extension of the hip joint, but it also contributes to external rotation and abduction (upper fibers specifically) of the hip. Thus, a person with the common chronic positioning of the hip joint seen in a Left AIC pattern would want to train the gluteus maximus on both sides, but in different planes: the left glute max should be trained in the sagittal plane via hip extension to counter the chronic hip flexion, and the right glute max should be trained in the transverse plane via external rotation and the frontal plane via abduction to counter the chronic internal rotation and adduction, respectively. Again, I’ll talk about this more in Part 4, but I want you to have an understanding of the relationship between chronic joint position and muscle length, as well as the triplanar approach to conceptualizing the effect muscles have on movement. To this point, I’m sure Part 3 seems like a complete departure from Part 1 and Part 2. They are, however, all connected, and so getting through the at-times technical and tedious first two installments will indeed prove to be worth it (I hope)! Recall that the neurological and biochemical mechanisms I outlined in Part 1 and Part 2 were responses to a stress or perceived threat. More specifically, stress is interpreted by the limbic system of the brain as a threat to our health and survival and as a result activates certain physiological responses mediated by the sympathetic division of the Autonomic Nervous System. With regards to posture and movement, there is evidence (laid out in Part 1 and Part 2) to suggest that sympathetic nervous system activation can affect skeletal muscle via increasing its resting tone and rigidity and decreasing its resting length. But what does a stress response by skeletal muscle have to do with PRI and its application to treating and training people? It has been postulated that the right-side dominance that I described earlier in this piece is actually a survival mechanism in and of itself: in fight or flight situations, having a dominant/preferred side of the body in terms of muscle activity and movement allows the brain to avoid taking the minuscule but potentially life-saving amount of time to pick which side to react with. Since, as I’ve previously mentioned, physiological responses are fairly constant regardless of the nature of the stress or threat, it seems logical that shifting to our right side has simply been built in as a part of the sympathetic-driven stress response. Also recall that, from a biochemical standpoint, it is likely that the muscles that are most affected by the stress response—and thus possess the aforementioned characteristics of high resting tone and rigidity as well as shortened length—are the muscles that have the highest metabolic demand, i.e. the ones that are used to the greatest extent. And if the stress response dictates that we shift to our right side when stressed or threatened, that is absolutely going to create a side-to-side as well as a front-to-back disparity between muscles in terms of usage/metabolic demand, especially if this response is chronically active. Thus, a pattern of neurological activity—which I like to define in this context as “the body’s way of reinforcing a response that promotes survival”—gives birth to and reinforces a pattern of muscle activity, posture, and movement. –Injury Reduction: I’d first like to note that I deliberately chose the term “injury reduction” over the often used “injury prevention”. Realistically speaking, there’s no way to “prevent” injuries—unfortunately, things that are outside of our control can and do happen no matter how much or how well you prepare, train, etc. As clinicians and coaches, the goal should be to put the client in a figurative and sometimes literal position that makes them less vulnerable to those events and thus minimizes their risk of injury. PRI’s methodology can indeed play a large role in achieving this goal: postural and movement patterns that create side-to-side and/or front-to-back disparities in terms of muscle activity also create disparities in the wear-and-tear on those muscles, the connective tissues that sheath them and connect them to bone, as well as the connective tissues that make up the joints that these muscles cross and move. Teaching a client to “get out of” such a pattern and bringing them more towards a neutral position can reduce this wear-and-tear disparity, thus also helping to reduce the risk of injury. –Neuropsychological/Stress Management Aid: In these first three installments, I’ve established that chronic activation of the stress response of the ANS drives physiological responses (primarily via the cardiorespiratory systems) that can lead to specific patterns of muscle activity, posture, and movement. While the most obvious and probably most effective way of resolving this situation and mitigating this response would be to remove the stress altogether, in today’s world this is not plausible more times than not. We are thus forced to look for alternatives, and PRI provides one: becoming better at coping with and responding to stresses and threats. Stephen Porges’ Polyvagal Theory states that an inability to successfully remove or mitigate a stress or threat results in “falling back” on a more primitive response; for example, chronic stress can cause us to abandon prosocial and self-soothing responses and fall back on the sympathetic-driven fight-or-flight response. If we focus on reinforcing those prosocial responses, however, and “teach” our body to get out of a sympathetic-dominant state, then we can essentially make ourselves into better copers in the sense that we are able to respond to chronic stress that is less taxing on our bodies and more conducive to good overall long-term health. PRI does exactly that: it attempts to counter the physiological manifestations of the stress response (increased cardiorespiratory activity, specific patterns of musculoskeletal activity) via focusing on breathing and muscle facilitation/inhibition in order to move us out of a sympathetic-driven response to stress and to promote a response that is more neutral in terms of the balance of ANS activity. –Performance Enhancement: In order to optimize performance in the gym or on the field of play, an athlete must be able to maintain both neurological and musculoskeletal variability, being able to shift into and out of both neurological states as well as different movement patterns and postural positions as quickly and efficiently as possible. From a neurological standpoint, an athlete going 100% during a game needs to be able to “switch over” to a more parasympathetic-dominant recovery mode as soon as they take a rest, so that they are optimally prepared to perform when they return to play. From a musculoskeletal standpoint, if an athlete is “stuck” in a pattern that includes chronic hip flexion, then their ability to achieve full hip extension may be compromised; this could result in a decreased ability to produce power in movements as basic as running, and/or lead the athlete to compensate by getting that range of motion and power from another joint (perhaps the lumbar spine in the case of the hips) that isn’t necessarily equipped to handle that added stress. As I’ve already outlined under the previous two applications, PRI addresses and can help to improve both of these abilities. That’ll do it for Part 3. In Part 4, I’ll go into greater detail on the postural patterns that PRI identifies, methods of addressing these patterns, and more specifics about the practical applications I introduced above. Author’s Note: I would like to thank all of the wonderful PRI faculty members I have had the opportunity to learn from so far: James Anderson, Lori Thomsen, Jen Poulin, and Mike Cantrell. Their knowledge is only exceeded by their desire to help others learn the science of PRI and become better practitioners and coaches; I am extremely grateful for their help and guidance. I would also like to thank Eric Oetter, who first recommended Stephen Porges’ book to me and whose insight has helped to solidify my understanding of the neurophysiology underlying threat appraisal and response. Without all of you, these articles would not have been possible!